Standard or low resolution printing can be fuzzy, washed out or badly registered. I offer High Definition Reproduction (HDR) which means your text will be razor sharp and your images will be loaded with as much detail as the naked human eye can see. 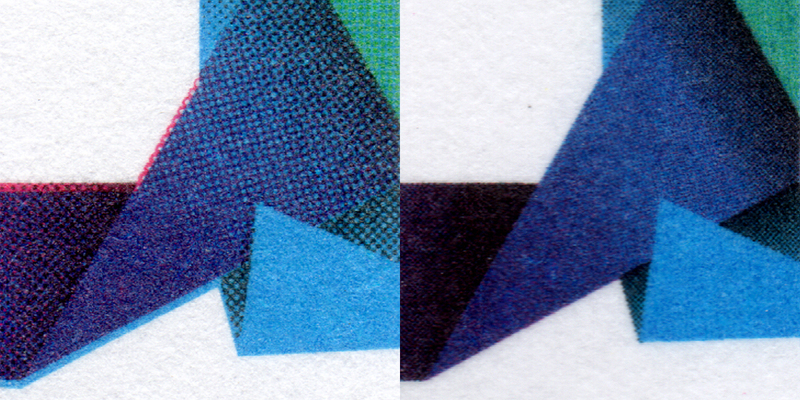 Above are two magnified images of part of a lithographically printed logo design. The area depicted in each is actually about 7mm X 7mm. The example on the left is of a standard quality print, while that on the right is an example of the High Definition Reproduction printing. Straight away you will see that the dots on the right are much smaller. This, in its self, results in more detail and clearer edges to text and images. The registration of the different colour inks is tighter too, with High Definition Reproduction. On the left you will see that the cyan and magenta impressions do not correspond as well as they should. This means the image will appear slightly blurred. On the right, the High Definition Reproduction image is tightly registered. This also ensures crisp and clear edges and details. Looking at another part of the same images; we can see the inking levels on the standard lithography, on the left, are a bit low. This could be because the ink is set too low or the water level is too high, resulting in washout. The inking levels on the High Definition Reproduction , on the right, are correct and consistent; the press having have been assessed by BSI and certified for ISO 9001, the Quality Standard. Please note that the apparent difference in the colour of the paper is due to a small variation in the paper stocks and not due to any image manipulation.